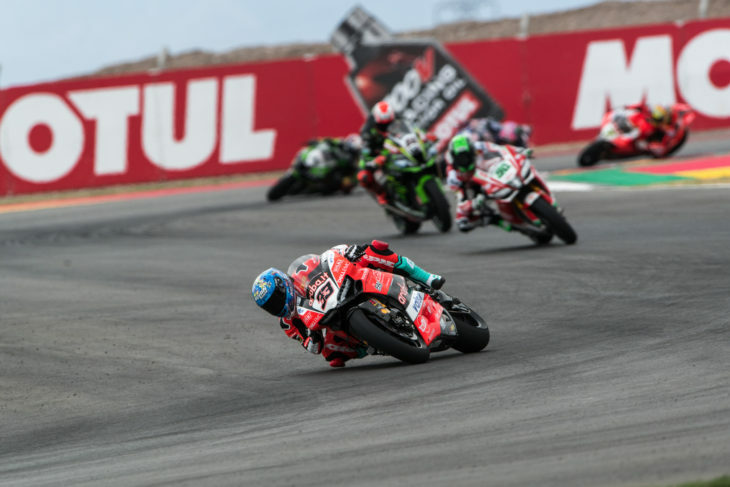 The Aruba.it Racing – Ducati stepped on the podium in Race 1 today at Villicum (Argentina), home of the twelfth round of the 2018 WorldSBK Championship, thanks to a second-place finished scored by Marco Melandri. The Italian, who took pole position with a record lap in 1:39.012, showed a strong pace also during the race despite difficult track conditions due to wind gusts and light rain, taking his ninth podium of the year. Chaz Davies, who started from third row after encountering a technical issue during Superpole, rode bravely to catch the group fighting for the podium. The Welshman, however, crashed out during lap 13 while he was in sixth position, fortunately without consequences. The Aruba.it Racing – Ducati will resume action Sunday, October 14th, at 11:30 local time (CET -5) for a warm-up session ahead of Race 2, which is scheduled to start at 16:00 local time.